1. Google: Considered by most end users to be the crown jewel of free office products, Google has it all—including safe, user-friendly email (with enough storage for business use) as well as document creation, storage and sharing. Google also has social services with Google Hangouts, video distribution through YouTube and more. 2. WordPress: Thinking of starting a blog? You should if you’re looking to stay at the top of the Google search rankings. Your first stop should be WordPress, a free, professional-grade blogging platform used by most businesses today. You can embed WordPress directly into your business’s website for seamless access with your other pages. Another blogging service you should check out is Weebly. 3. Wave: Wave is a financial application that your business can use to obtain free invoicing, receipts, accounting and finance services. Additional services are available for $9 per month, too. By using Wave, you can automate many of the processes you would typically put into the hands of an accounting team. It’s great for small businesses operating on a budget. 4. Trello: If you’re outsourcing any of your business’s operations, you’ll need to communicate with your vendors on a regular basis—and Trello is one project management platform that you can use to exchange messages, documents and other media files. 5. 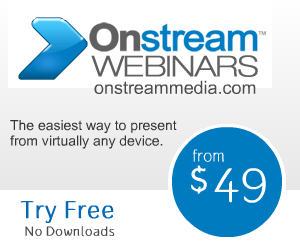 Onstream Meetings: Looking for real-time video, text or audio chatting? If so, look into Onstream Media’s new free Web conferencing service. Using Onstream, you and your team members can exchange and edit documents, as well as media files, in real time. And you’ll also gain access to high quality—and secure—media transfers, too.